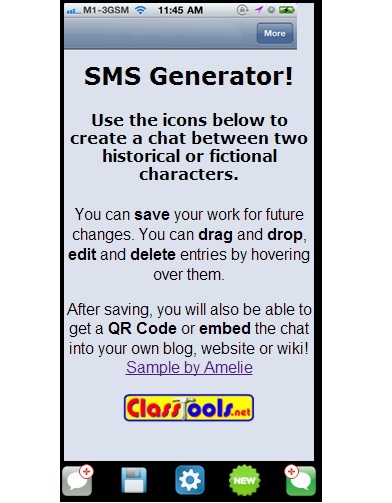 Here’s a quick and fun tool for getting attention in a classroom: a SMS Generator. It’s a website that allows you to create text conversations, and then save it for future reference with a link or by embedding it in a website. Present it to the group, either by projecting onto a screen if you have web access (wall screen or even a mobile device) or by printing a copy and hanging it up. Without mentioning the actual Scripture, ask the students to read the chat and figure out what they can about it. After hearing their ideas, ask someone them to read the story that inspired the chat: Luke 15:11-32. Revisit the discussion to see how the students’ perception of the chat – as well as the parable- changed. 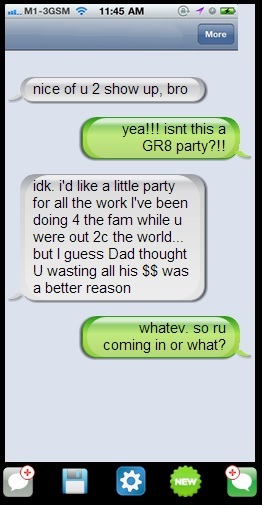 The SMS Generator can also be a way for students to unpack the Scripture. Pair up the students and give them each a character from the parable; for instance, Dad/ Older Son, Dad/Younger Son, Older Son/Servant, etc. Ask each pair to create a chat between their two characters, based on the text they just read. If you have internet access in the classroom, they can create and save the chat online and send you the link. If you don’t have internet access in the classroom, have the students use your example as the model to write out their chat, and you can enter them online later, or you can assign this as homework. Whether you use the SMS Generator to create chats based on Bible characters, saints, or even the Pope and your Pastor (! ), and especially given the popularity of texting among kids as young as 10, this exercise will be a great way to grab their attention on almost any topic, just by changing the “characters” involved!